To publish reports, commentary and testimonies that proclaim the gospel of Jesus Christ and His power to change lives today. APU Life is a marketing tool that communicates the university's image, mission, and distinctives to its constituents (alumni, donors, parents, trustees, internal community) through information about its people and programs. Inform and enlighten othes about the goals, purposes and activities of Marketplace Ministries. Serves as the University's primary communication tool with off-campus constituents. To provide for our constituency ministry-related news along with Bible teaching from a messianic perspective. To keep Luke Society donors informed of how their gifts are being used to provide health care and the gospel to the poor around the world. To inform readers of what God is doing through HCJB Global and to inspire them to get involved in the mission through praying, giving and going. ByFaith is the magazine of the Presbyterian Church in America. Its mission is to draw readers into the full life of the Church by informing, edifying, and encouraging them with the news of God's kingdom. To inform, inspire, encourage, and challenge broadcast listeners, Bible School students, ministry donors, and other friends of the Voice of Prophecy. To unite Wheaton College constituents, encourage effective communication, and perpetuate enthusiasm for the college. A newsletter in magazine format. This publication keeps friends and supporters informed about the ministry's worldwide outreach. Evangelism and education of and for truck drivers (primarily). To be a "Gateway" of missions information to educate and motivate supporters of Intercede International and Canadian Christians about the work of God being done among all nations by indigenous Christian missions. World Vision magazine affirms people responding to God's call to care for the poor by providing information, inspiration, and opportunities for action. Priority!, a national magazine produced by The Salvation Army's USA Eastern Territory, promotes holiness, prayer, and evangelism through the life stories of God's people. Advertising accepted from nonprofits only. To show how God is directing the hearts and hands of Campus Crusade for Christ staff members around the world, and to challenge our readers to join with us in making Christ known. To inform the public of ministry opportunities and report on ministry of various mission teams. As an arm of our ministry, we use it as a teaching tool to the Body of Christ. We place special emphasis on current events in the light of Bible prophecy concerning the Jews, the Nations, and the Church. To provide information, motivation and inspiration to Christian writers and speakers. To teach the truths of God's Word to friends and alumni of Dallas Seminary. 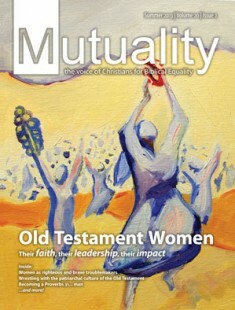 Mutuality provides inspiration, encouragement, and information about equality and justice issues in the church, home, and world by popularizing and expanding the message of biblical equality and by creating a community of egalitarians.